We offer a limited number of free 2–hour curbside parking spaces on Hawthorne Street directly north of Flandrau (see map for the yellow "Limited Flandrau Guest Parking"). After purchasing admission, ask at the front desk for a permit to place on your dashboard. Parking is on a first-come, first-served basis. You can often find open metered spaces on First Street and Second Street, both north of Flandrau (see map for green "Hourly Meter Parking" areas). You can pay at credit/debit card pay stations. Plus, all metered spaces on campus are free after 5pm! Click here for more info on how to pay for parking meters. 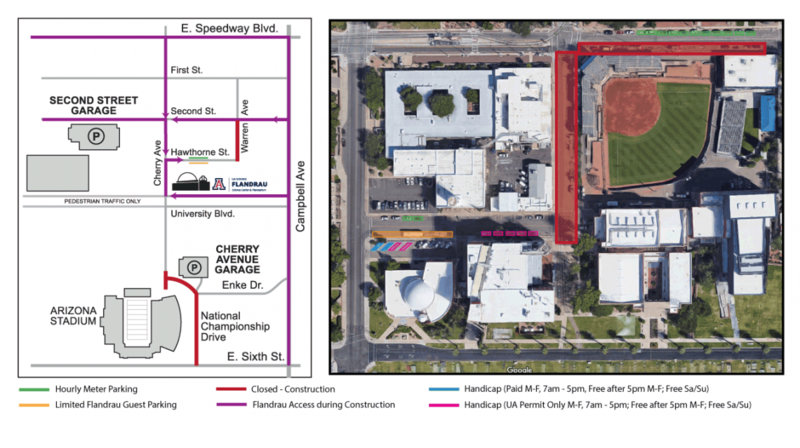 You can find nearby garage parking any time at the Cherry Avenue Garage just south of Flandrau. Click here for most up-to-date information on hourly rates. We are unable to offer parking validation or free garage parking. There are two paid handicap parking spaces behind our building (see map for light blue areas). Click here for more info on how to pay for parking meters. Additional spots are available after 5pm (see map for pink areas), but are UA Handicap Permit Only Monday - Friday, 7am to 5pm. We offer a limited number of free curbside parking spaces on Hawthorne Street directly north of Flandrau (see map for yellow "Limited Flandrau Guest Parking"). After purchasing admission, ask at the front desk for a permit to place on your dashboard. Parking is on a first-come, first-served basis. Metered spaces on First Street and Second Street, both north of Flandrau (see map for green "Hourly Meter Parking" areas) are free on Saturday and Sunday! You can find nearby garage parking any time at the Cherry Avenue Garage just south of Flandrau. On weekends, the Cherry Garage is free. Click here for most up-to-date information on hourly rates. On Saturday and Sunday, there are options for handicap parking. There are 4 spots behind our building, and 5 to the northeast (see map for light blue and pink areas). Please note, parking options may change dependent on sporting events and special events planned by the University. You can reach us by the SunLink Street Car! We are one block south of the 2nd Street/Cherry Avenue Stop. If you need assistance with trip planning, or additional information on transfers, connecting routes, or times please visit the Tucson Streetcar website at www.sunlinkstreetcar.com. You can reach Flandrau by the Sun Tran bus system. Routes 15, 9 and 20 stop directly across the street from Flandrau — your stop being the "UA Mall." If you need assistance with trip planning, or additional information on transfers, connecting routes, or times please call the Sun Tran bus station at (520) 792-9222 or look at the system wide transit map online at www.suntran.com.